Southern Exposure’s annual Monster Drawing Rally is coming up again! I had a ball doing it. 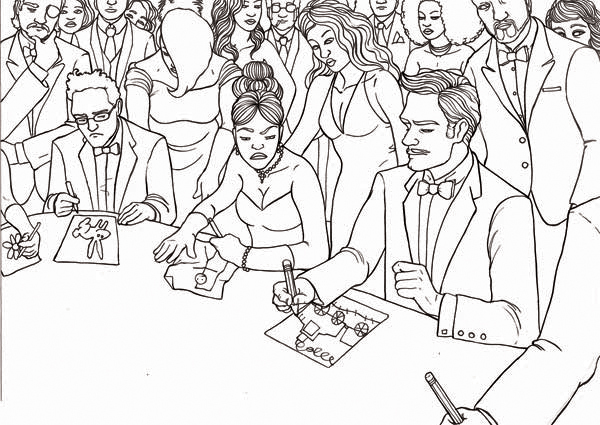 It took a minute to decide on a theme: I liked the idea of making an image that reflected the anxiety levels of participating artists (it’s incredibly nerve-wracking, drawing while people watch you), while still celebrating the fabulous event that is the Monster Drawing Rally. 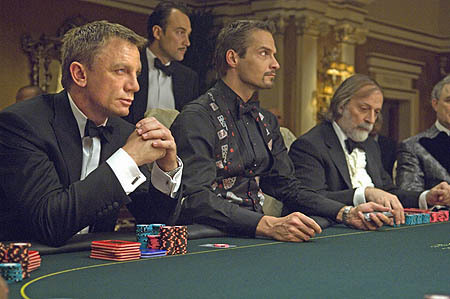 Having just recently seen ‘Casino Royale,’ I started thinking about how funny it is that utterly sedentary activities like card-playing and drawing can somehow become such action-packed spectacles. Based on that correlative logic, the only thing that made sense to do, then, was devise an utterly glamorous casino-like scene, with the key players engaged in a battle of wits, but…making crappy drawings. It wasn’t until I was almost done that I noticed that this year is a “007,” which just settled it. 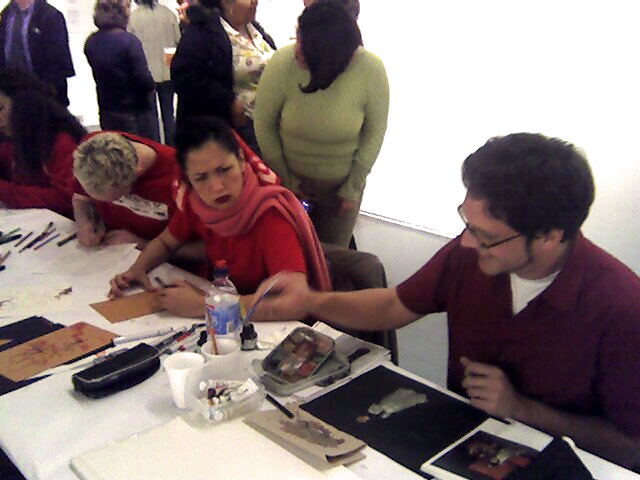 The image below is from MDR 2005, when my Drawing Night compadres and I all drew in tandem: same shift, matching red outfits. You can see some people milling about behind us, watching. It gets way, way, way more crowded as the night goes on. MH draws like an angel everytime our group gets together, and it pisses me off to no end. All color and text was added in Photoshop. Come to the Monster Drawing Rally! So you, too, can hover behind some sweaty-palmed nervous drawer, instead of living vicariously through this post! This past Wednesday the 14th was extra-lovey-dovey, given the special event Saint Mary’s College hosted for artist and professor Carlos Villa. 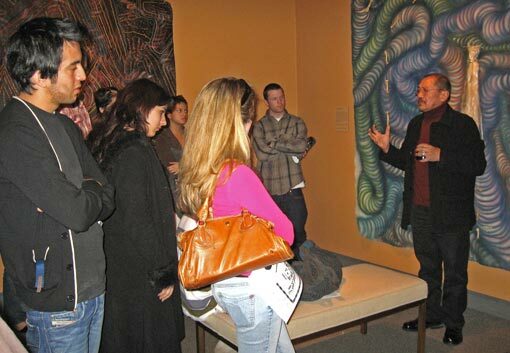 I’ve waxed on about Carlos in the past: he was and still is an exemplary mentor, teacher, and artist. Were it not for having taken a couple of classes with him when I was a student at the San Francisco Art Institute, I don’t know whether I would have found my path. Carlos voiced the notion of the artist-activist-scholar in his Worlds In Collision course, clarifying for me (for the first time, as a young pup) that an artist’s role can and does move beyond the self-serving market/gallery/artworld structures into richer, more diverse, community-oriented terrain. 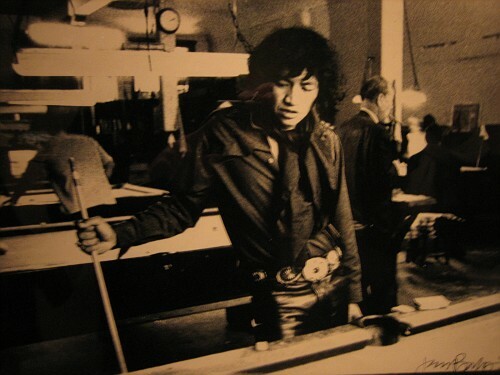 Who knew the man had leather pants? So, having spent the past couple of weeks waffling (yes) over which blog company to continue Woffling (yes) at, my friend Max has finally put my fussy uncertainty to rest, by creating an all-wofflehouse brown-plate special. I’m thrilled to be moving forward with this forum for sharing information, particularly with projects such as Galleon Trade, the California/ Mexico/Philippines show I am organizing for the Mag:net Galleries in Manila this July. Momentum and buzz is already building for this project, so I’d like to be able to share updates publicly, quickly and dynamically. So that’s it, in a nutshell. The compulsion to share too much, too publicly has become something of a national disorder, so I’ll try to keep Wofflings engaging and entertaining, but not too confessional. Much of this writing will be about arts-related items that I care about or am involved in, but you may be subjected to occasional ramblings and gratuitous photos about other interests (my obsessions with Longs Drugs, the Madonna Inn, cockroaches, etc). Whence They Came. Sort of. Humboldt County, where Father Woff grew up, has its own Manila. Mother Woff grew up in Manila (but not this Manila). 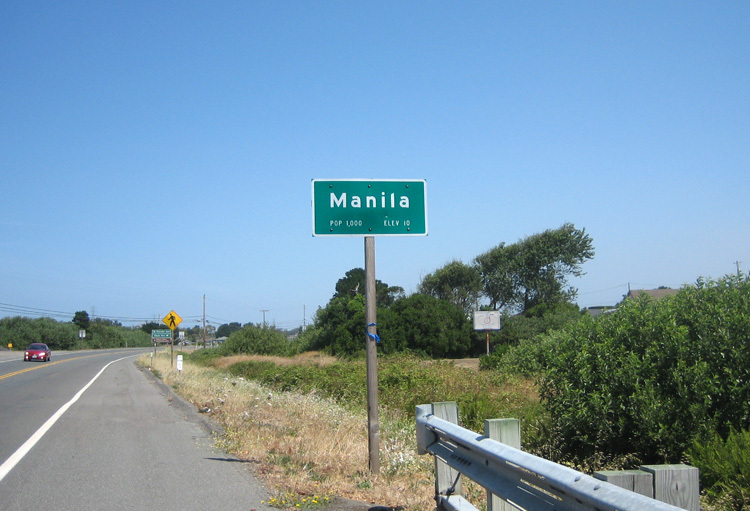 Manila, Humboldt, is next to Samoa, Humboldt. Samoa, Humboldt, is next to Eureka, Humboldt. If this makes any sense at all, then you’re probably Filipino, too. I’ve thought a lot about the pervasive transnational ties most Filipinos in America maintain with the Philippines. The logic behind this photo/town-name cracks me up, but actually, it’s a great illustration of the blurred boundaries between “here” and “there”. Immigration to the U.S., as with most other host countries, is rarely-to-never a clean break with the motherland, and a clean-slate new beginning. There’s always back-and-forth: family visits, phone calls, emails, gifts, remittances. I’ve made frequent visits to Manila as an adult and an artist, and am trying to do what I can to create more arts exchange across the Pacific. The internet has an uncanny way of collapsing distance rather handily, in this regard. Sociology books such as Emily Noelle Ignacio’s “Building Diaspora” (Rutgers, 2005) have been providing me with a clearer sense of the possibilities for leveraging transnational exchange between Filipino and Filipino-American artists in ways I could never have conceived of ten years ago. Hell, I didn’t have email ten years ago! Ignacio describes how Filipinos widely scattered around the world, have embraced the internet as a way to develop connections, community and a stronger sense of self-identity. She identifies the multiple modes in which it’s contributed to creating a more concrete sense of the Filipino diaspora, how it has helped Filipinos better understand and articulate their postcolonial situation, as well as their relationship with other communities around the world. 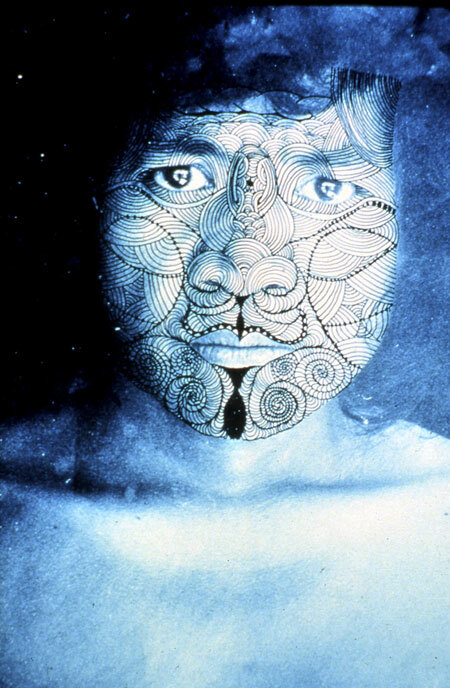 Moving beyond, or perhaps complementing Yen Le Espiritu’s definitions of “home” (Homebound, 2003), Ignacio suggests that while “home” is ever further removed from geographic place, it is being increasingly territorialized and renegotiated in cyberspace. Word up, sis. You are currently browsing the Wofflings weblog archives for February, 2007.